Michael Medved, Sarah Palin Was Not ASKED To Explain The Purpose Of Paul Revere's Ride! The liberal media shows it's typical liberal bias by smearing Governer Palin as usual. That is why far more people watch the news on Fox. 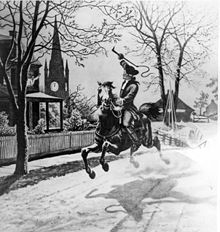 No one can say for sure that Paul Revere didnt ring a bell, and he DID warn the British because they would of heard him just like the Americans did. They is so scaired of Palin because they know she would easily defeat the porch monkey in the White House. Sarah Palin is the most down to earth, wholesome, and courageous all-American that we've seen in politics since Ronald Reagan. The people that hate (read: fear) her the most are those who detest the idea of a return to the moral values that made our country the leader, and the envy, of the world. Those who have been swimming in the salacious sewers of corruption are in morbid fear of having their lascivious ways exposed as antithetical to the future of a great country. Additionally, many detest the idea of a woman the having the authority to lead. If ever there was a woman who proved she could lead it is Sarah Palin. Just research her record from city council to governor and how masterfully she fought the corruption, even in her own party and you'll get a good idea of why the Washington establishment wants nothing to do with her. They don't want someone inside the beltway that is willing to tell the truth, even if it means exposing corruption in her party. Todd, take a good look at this excerpt from your response: "They is so scaired of Palin..." You may want to refer back to your elementary school text books, where you'll find that the subject and verb in a sentence must agree. It should read... they are, not they is. A good old fashioned dictionary will show that the correct spelling of the term is s-c-a-r-e-d. Learn how to spell and use correct grammar before you attempt to hurl ignorant racial slurs. Better yet, people with such a lack of intelligence should not attempt to offer political opinions. Sheer ignorance, much to the like of that which is in question, is what got this country to its current economic state. Looking at your response, we could definitely do without your opinion. Governor Palin needs all of the help that she can get, but not from ignorant racist bigots. The definitions of "ignorant" and "bigot" can be found in any online dictionary such as www.dictionary.com.